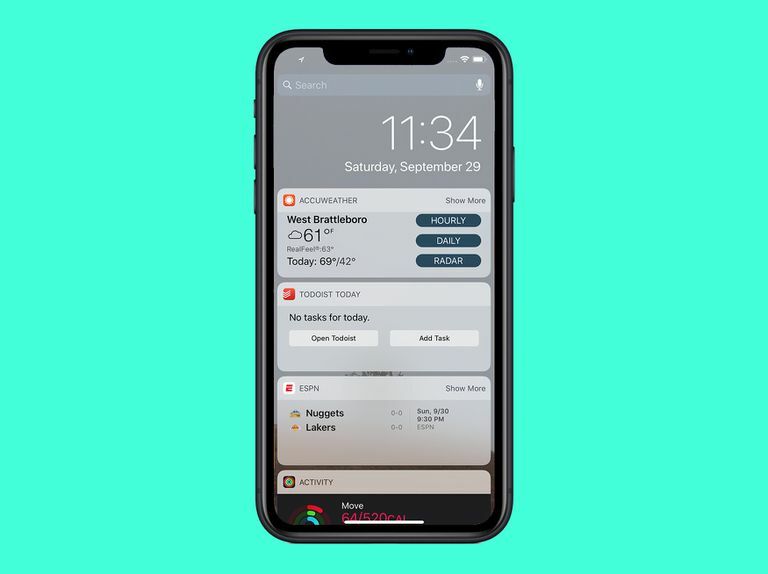 Users of the iPhone and iPad have been enjoying Notification Center — the pull-down menu that's packed with short bursts of information from apps — for years. Whether it was to get the temperature, stock quotes, social media updates, or other breaking news, Notification Center delivered. But it didn't deliver completely. It showed some information, but what it showed was basic and primarily text. To do anything with that text, to act on the notification you'd just gotten, you had to open the app that sent the notification. In iOS 8 and up, all of that's changed, thanks to a feature called Notification Center Widgets. Widgets live within Notification Center. Once you've got widgets installed, you can perform quick tasks right in Notification Center without going to the full app itself. Here's what you need to know about how to get and use Notification Center Widgets. What Are Notification Center Widgets? Think of a widget as a mini app that lives within Notification Center. Notification Center used to be a collection of short text notifications sent by apps that you couldn't do much with. Widgets essentially take selected features of apps and make them available in Notification Center so you can use them quickly without opening another app. Not all apps offer widgets. Support for the widgets must be built into an app, so not every app on your phone — even the ones that otherwise work with Notification Center — will be compatible. You can't get widgets on their own. Because the feature has to be built into a larger app, you can't just download a widget by itself. It's an integral part of the app it comes from, so you need the full app installed on your phone, too. To find apps that offer widgets, search the App Store for "Notification Center Widgets." Swipe down from the top of the screen to open Notification Center (on the iPhone X and newer models, you specifically need to swipe down from the top left corner). Scroll to the bottom of the screen and tap the Edit button. This shows all apps that offer Notification Center Widgets. Look for the More Widgets (on some older versions of the iOS, it's labeled Do Not Include) section at the bottom. If you see an app whose widget you want to add to Notification Center, tap the green + next to it. That app will move to the upper menu (the widgets that are enabled). Tap Done. Once you've installed some widgets, using them is easy. Just swipe down to reveal Notification Center and swipe through it to find the widget you want. Some widgets won't let you do much (the Yahoo Weather widget, for instance, just shows your local weather with a nice picture). For those, just tap on them to go to the full app. Others let you use the app without leaving Notification Center. For instance, Evernote offers shortcuts to creating new notes, while the to-do list app Finish lets you mark tasks completed or add new ones.